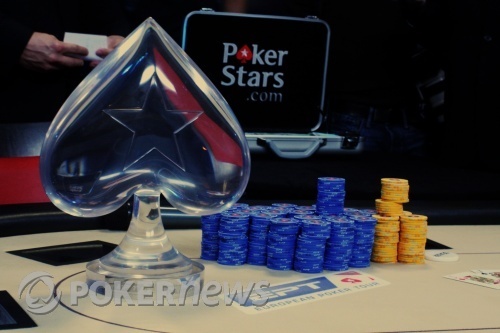 Will Fry from Nottingham, UK won the first ever EPT Hungarian Open. Fry admitted that he had never played a major tournament before this one. He also mentioned that he intended on donating a percentage of his winnings to charity. He wants to help raise awareness for world poverty. 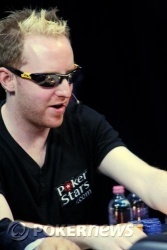 I guess you can consider Fry as a Robin Hood of poker, much like Barry Greenstein who also donates a percentage of his tournament earnings to various charities. When asked specifically what he would be doing with his €595,839 first place prize, Fry said, "I'm going to pay my mortgage. Help out my family and friends. And look into some good charities to help stop third world hunger. I'm going to try to do my bit to help and hopefully others will get involved." Fry has been supporting himself by playing poker over the last three and a half years. "I'm not really fit for the nine to five lifestyle. I have been playing poker since I came out of the womb," he joked. I asked Fry about the moment he thought he could win this event. He replied, "Right from the start I thought I could win. My chances were not easy. But I know how to play. We all get two cards and if I get good cards I definitely know what I'm doing. It all worked out for me." 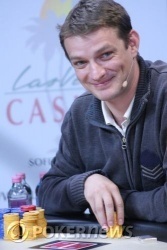 Fry outlasted a field of 562 players in order to win the largest tournament ever held in Hungary. Call it great cards or karma, but Fry emerged victorious here at the Las Vegas Casino in Budapest. Congrats to Will Fry and score one for the good guys. Hrisca made it 150,000 from the button and Fry re-popped him for 650,000 total. Hrisca announced all in, Fry announced call, and they were on their proverbial backs for Hrisca's tournament life. And just like that, the Romanian is no more, and we have ourselves a winner. On consecutive hands... the button limped, the big blind raised, and the small blind folded. Will Fry raised to 150,000. Hrisca reraised to 700,000. Fry folded face up. Hrisca shrugged and dragged in the pot. Fry won two small pots in a row to take a slight chip lead. We're playing a new level. At this point it doesn't matter too much since both players have shown their willingness to play big pots during the initial ten hands of heads up play. Very next hand, the chips went in. Fry raised to 140,000 from the button, Hrisca reraised all in and Fry called. Two pairs for Fry, and he doubles through to stay in the game. Ciprian is still a little ahead though.